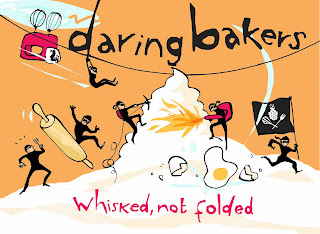 This is my second Daring Bakers Challenge and I waited until the last possible night to do it. I had intended to bake it early so that my mom and sister could help me test it out, but my nights have not been my own lately...(see evidence below) and that's why I love taking the time out to do the challenges. I can't wait till the next month!! The challenge was hosted this month by Alex (Brownie of the Blondie and Brownie duo: http://blondieandbrownie.blogspot.com/), Jenny of Foray into Food (http://forayintofood.blogspot.com/) and for assitance with alternative baking, Natalie of Gluten-a-Go-Go (http://glutenagogo.blogspot.com/). I followed the directions exactly, except for one tiny substitution of Smart Balance Light for the unsalted butter, those baby pounds dont go away on their own. As Danny and I were tasting it (as I type), we were worried it was a bit dense, but when I looked at Shuna's page, it looks exactly like hers and the taste is pretty good. In terms of preparation, it was easy and I would definitely make it again. Yum! ...and this was her until the kids came home! Preheat oven to 350F, Butter one tall 9" cake pan. 1. In the bowl of a stand mixer fitted with a paddle attachment, cream butter until smooth. 2. Add sugar and salt & cream until light and fluffy. 3. Slowly pour room temperature caramel syrup into bowl. 4. Scrape down bowl and increase speed. Add eggs/vanilla extract a little at a time, mixing well after each addition. Scrape down bowl again, beat mixture until light and uniform. 6. Turn mixer to lowest speed, and add one third of the dries. 7. When incorporated, add half of the milk, a little at a time. 9. Take off mixer and by hand, use a spatula to do a few last folds. making sure batter is uniform. Place cake pan on cookie sheet or 1/2 sheet pan. Set first timer for 30 minutes, rotate pan and set timer for another 15-20 minutes. Your own oven will set the pace. Bake until sides pull away from the pan and skewer inserted in middle comes out clean. Cool cake completely before icing it. Cake will keep for three days unrefrigerated. 1. Cook butter until brown. 2. Pour through a fine meshed sieve into a heatproof bowl, set aside to cool. 3. Pour cooled brown butter into mixer bowl. 4. In a stand mixer fitted with a paddle or whisk attachment, add confectioner's sugar a little at a time. When mixture looks too chunky to take any more, add a bit of cream and or caramel syrup. Repeat until mixture looks smooth and all confectioner's sugar has been incorporated. Add salt to taste. Caramelized butter frosting will keep in fridge for up to a month.To smooth out from cold, microwave a bit, then mix with paddle attachment until smooth and light. I took some of the frosting and mixed it with my favorite Wilton dyes - brown - and made some cute designs. That is the extent of my frosting abilities, but I think it works. 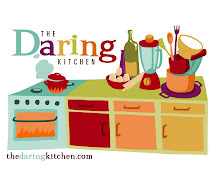 Wow...Daring baker with a baby! Your cake looks great. I'm sure that Macie appreciates the cake...maybe her milk has a caramel taste! ;-) Great job!! !